Kasabian’s first top 10 single, entering the chart at #10 on August 15th 2004. Again a 10″ was available, alongside 2 CD formats for the first time. 2 new tracks, the excellent Jagz Kooner mix, the L.S.F video and the album version of the track were be spread across the formats. PARADISE cat numbers 10-11 were taken by promos, with the actual release allocated 13-15. PARADISE10, the CD promo, was packaged in a folded sticker, stapled on 3 sides with tear-off perforations. 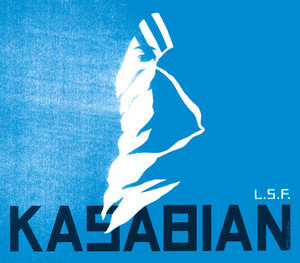 PARADISE11 was similar to the Club Foot 12″ promo, in that the sleeve had a Kasabian man shaped hole cut into it, revealing the logo on the label inside.